1. My girlfriend Angela just had her baby boy, Jacob Joseph Kurtz, this morning! How cool is his birthday?! 6/16/16! 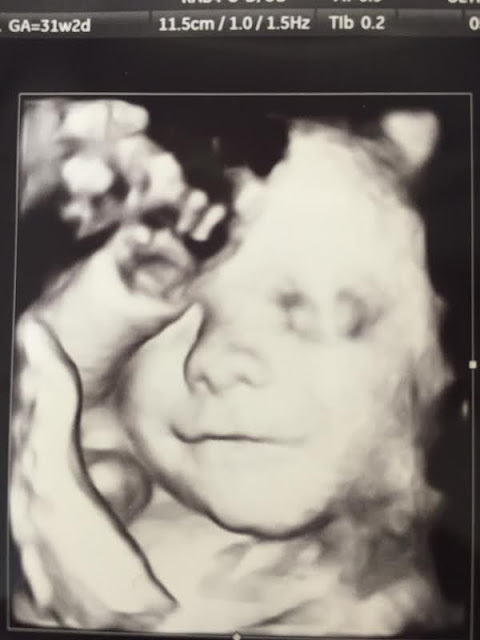 I couldn't be more excited for her! We've gone through our pregnancies together so it's very surreal to me that her baby boy is here because that means one thing...I'm next! 2. My heart is broken into pieces hearing about Lane Graves, the 2 year old boy who was grabbed by the alligator in Orlando. Me and Billy have actually stood right in that same water where that little boy was, years ago when we vacationed there. We just keep thinking about if that were Camden and how absolutely horrifying it would be. Words can't describe how my heart aches for this family. How Far Along? 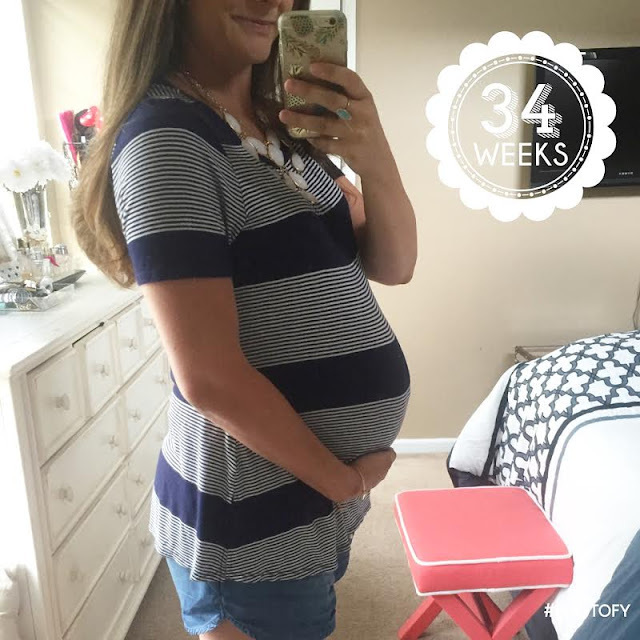 34 weeks, 2 days! 6 WEEKS LEFT! Stretch marks/Swelling: None yet! I luckily don't have any swelling yet, but that could change especially with this heat! I also got news at my last doctors appointment that my platelets are low (just like how they were when I was pregnant with Camden) which means I will have to be put on a steriod again for the last 4 weeks of my pregnancy in hopes to get them up before delivery. However, even if they do get them up they could still drop during labor like they did with Camden and if they go low enough then I won't qualify for an epidural. I've been TRYING not to freak out about this since I can't do anything about it, but it's a little unsettling. I NEED THOSE DRUGS! Just praying that when the time comes I will be able to get one. Mood: Getting very excited and like I mentioned the other day, my nesting is at a whole other level (thank you for all your advice!) I'm going around our house cleaning and organizing everything. Next on my list is installing the car seat base in my car and playing around with the double stroller! Nursery: Done! Shared pictures here. Movement: All the time...baby boy is very active! I can feel all his hiccups now too! Sleep: Still been good sleeping, except as of lately I typically have to get up once per night to go to the bathroom. Workouts: Surprisingly enough I've upped my workouts the past few weeks - I've been walking and jogging more often which I've found actually makes me feel a little better. Especially when I focus (and remember to) stretch a lot afterwards! 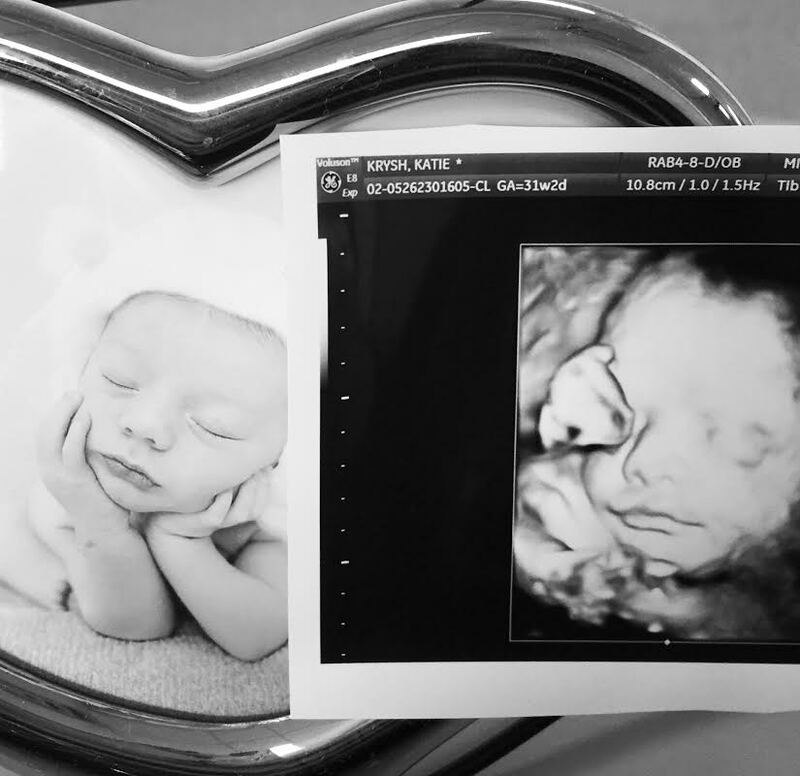 Best Moment This Week: It wasn't this week, but it was the other week when we had our 3D ultrasound. 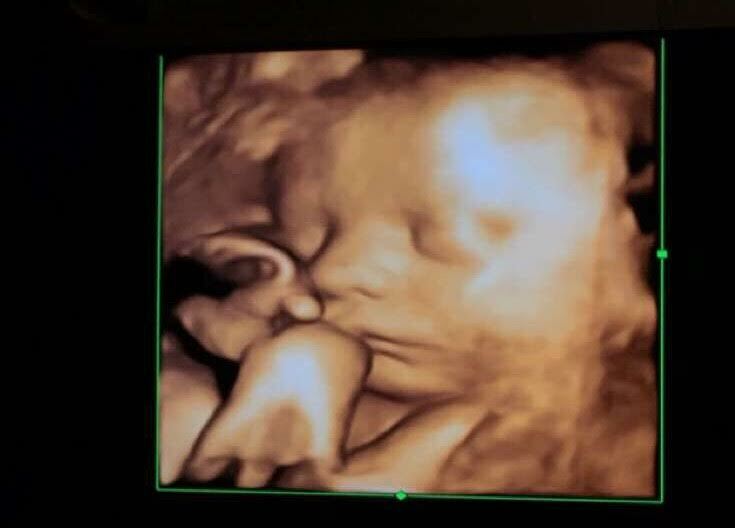 Getting to see baby boy was AMAZING because he was in the perfect position and was showing off for us! He was smiling, resting his hand on his face, and we found that him and Cam look SO much alike! It was so sweet and the ultrasound technician gave us like 30 pictures! Oh my heart breaks for that family in Florida too! When I read what happened all I could think of was that it easily could have happened to anybody. Sure when you think about it, it's Florida and you need to be mindful of the water because there are alligators everywhere, but when you are from an area that doesn't have alligators you tend to forget that. It's devastating. You look so cute Mama!! Will be thinking of you these next few weeks. I had a (planned) no drug labor and while it was incredibly tough, I promise you will be okay and you can do it!! I say this offer encouragement and to let you know if you need anything or have questions about it to be prepared in such a case, just holler! Otherwise -- I wish the best for you so you can get that epidural! :) I hear they're amazing! !